We develop and produce measurement amplifiers for the display and recording of measurement data. 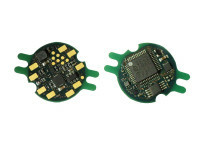 The measuring amplifier are suitable for the connection of force sensors, torque sensors, acceleration sensors and displacement sensors as well as for all active sensors with voltage output or current output. In addition to amplifiers with analogue output we produce measuring amplifiers and data logger with interfaces and with radio transmission. For measuring amplifiers with interface we supply application software, programming interfaces, extensive protocol documentation as well as programming examples.